You: Planning on watching the World Series tonight with other people. Baseball fan, but not a student of the game. Needing a relevant baseball tidbit to impress a friend. Me: Provider of baseball tidbits. This is the fourth World Series matchup between the Cardinals and Red Sox. The Cardinals began this Series series with a memorable win in a seven game series that provided the most controversy that has ever surrounded Johnny Pesky. The game was in St. Louis. Sox center fielder Dom Dimaggio had just tied the ballgame at three apiece heading in to the bottom of the eighth with a two run double. Enos Slaughter was the first Cardinal to the plate. That season he had finished third in MVP voting, and the Hall of Famer led the inning off with a solid single. With two quick outs, it looked as if the Sox would get out of the inning, but Harry Walker put a deep single in to the left field gap. With manager Eddie Dyer calling for the hit and run, Slaughter came tearing around from first, and as the relay throw came in to shortstop Johnny Pesky, Slaughter ran straight through the stop sign and turned for home. This is where it gets a little cloudy, as some say that Pesky, not expecting Slaughter's aggression, looked toward first before sending the ball home. Some say he saw what was happening and held the ball anyway for an extra beat. A few will argue that he threw it immediately and just didn't have enough mustard on the throw. Either way, this gave Slaughter just enough time to get in under the tag and provided the Cardinals with the run they needed to win the World Series. 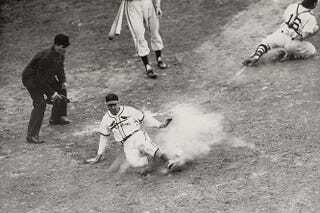 Slaughter's Mad Dash is an iconic play in baseball history, and it's another example of the history between the Cardinals and the Red Sox. This has been your useless baseball knowledge for today, now go (sort of) impress someone with it.